This was delicious. I used leftovers in an egg roll fried in the air fryer and used mae ploy for the dipping sauce for a Skinnytaste challenge on their What's for Dinner FB page. Also amazing. Another great chicken recipe from this book. Turkey bacon, a recommended substitute, worked really well in keeping the chicken moist. We used only about half the BBQ sauce and (store-bought) ranch dressing and it was plenty for us. Quick and very tasty. Cooking the marinade with the chicken and onions ensured that none of the flavour was left behind. Perfect warm us up for this cold night. Delicious! I made my own rotisserie style chicken in my instant pot for this pie. I cooked mine in my deep cast iron chicken fryer and it was the perfect size. This is described as a gratin but my family thought it was a different take on Shepherd's pie, one everyone really enjoyed. The turkey filling was moist and flavourful and the potatoes, especially the ones on the very top, were golden and crispy and delicious. I made this dairy free, omitting the cheese and replacing the milk with stock. I brushed the potatoes with a little olive oil before broiling. Garlicky shrimp with smashed chickpea "mofongo"
The flavours were good - very garlicky but tasty - but the dish was quite heavy to me. I also discovered with this recipe that I don't care for the texture of mashed chickpeas, and they made up a large portion of the dish. I used 2 skillets to reduce the cook time. A good basic recipe. Came together quickly. I used all shrimp. Served these with lettuce wraps instead of buns. Almost a little TOO juicy and messy. So easy, so tasty! This recipe was remarkably flavorful and interesting, despite such simple ingredients and easy prep. The only change I made was to use boneless, skinless thighs, which worked great for us. The combination of Brussels and butternut was really good, and the sauce was perfect. I’ll make this again for sure. Great flavour and the timing worked well. I particularly liked the high ratio of vegetables to chicken and the method of broiling at the end to add extra colour. Daughter, son-in-law and I all agreed this chicken was delicious. Son said just ok. I didn't have cauliflower, asparagus or bell pepper so I just used purple onion and we had green beans and mashed potatoes on the side. I made a recipe and a half of the chicken and mustard sauce. Loved that it used boneless thighs. We really enjoyed this. I misread the recipe and used bone-in chicken thighs so I cooked the chicken and vegetables together for the entire cooking time. The honey mustard sauce was delicious with whole grain Dijon. Will definitely make this again. I loved this. I used the Italian Chicken Sausages called for. I did make a few substitutes. I used one red bell pepper instead of two but my pepper was huge, red potatoes instead of russet, and Italian seasoning instead of rosemary. Husband and son hate rosemary. I then followed all the other ingredients and instructions. Unimpressive but a decent base on which to build. Loved all the flavors in this dish but the boneless breasts came out too dry, even though I cooked them minimal time. Probably won't repeat unless I use thighs with bones and skin, but would have to adjust vegetable cook time because chicken would take longer to cook. Son in law didn't care for the meatloaf but the rest of us enjoyed it. Everyone enjoyed the green beans and daughter, son in law and I loved the carrots. I did a recipe and a half to feed the 5 of us. We loved the vegetables but the meatloaf wasn't our favourite. There was a little too much ketchup for us though I used only half and I personally prefer my onions to be less conspicuous (I generally cook them first for recipes like this). The meat and carrots were nicely cooked in the allotted time but the green beans, which must have been on the thin side, were done 7 minutes sooner. Really delicious and easy recipe. I found out I love roasted cauliflower rice. The fish was good too. Makes a thin pasta sauce, but I like my sauce that way. I used ground beef, browned the meat and removed from the pan and drained. Then I sauteed the onion and garlic in some olive oil. Very easy dish! Followed instructions to a tee. Was extremely watery. Didn't look anything like photo. Delicious cold weather soup - simple to make but rich in flavour. I used an immersion blender in the pot to break some of it down and thicken it after it had cooked. This was delicious. We topped ours with cottage cheese instead of Ricotta since we like cottage cheese better. I used some of my fresh basil from my kitchen window for topping. Quick and easy in the instant pot. This was very good but family likes it better not in a soup version. Instead of using just 5 oz of noodles I used the whole 8 oz. package. I omitted the red bell pepper since son doesn't enjoy them. This was an Ok version of Goulash but I've had some I've enjoyed more. I did like that it was made quickly in the Instant Pot. I added some black pepper to mine to add a little more flavor. Easy and delicious made in the Instant Pot. I had about a cup and a half of brown rice left over from another meal so I just stirred that in at the end. I omitted the raisins and used smoked paprika instead of Hungarian since I didn't have any of the latter. This was so quick and easy in the Instant Pot. I used some of the wild caught frozen salmon I got at Aldi recently. I used whole tiny frozen green beans from Aldi as well and put them both in the IP frozen along with the eggs. I added one minute of cooking time for the beans and salmon and it was perfect. This was a delicious lunch. I did only eat one boiled egg on my salad instead of two. The base of this was a tomato-vegetable soup that was creamy but not very rich. I realized after I'd added the tortellini that my package was about 100g more than what was called for; with the extra pasta, this fed 4 generously as a meal. Flavour didn't wow anyone but it made for a nice lunch. Made for daughter and I. We thought delicious. I used a 5 cheese tortellini instead of 3 since they had some at Aldi. Daughter and I loved this one. Hubby thought just ok. Delicious! It was well-spiced without being hot, everything was nicely cooked and it made excellent use of pantry items. There was a little too much liquid in the beans for me but it took just a few minutes using the saute function to reduce it. I skipped the avocado and served it with tomatoes, cucumbers and lots of fresh coriander. Son, daughter, son in law and I all agreed this chicken was delicious. I didn't have time to marinate just left in buttermilk, hot sauce mix for a few minutes. I bet it would be even better after a longer marinate. Daughter and I really enjoyed the slaw too. Will be making this one again. Delicious and the slaw was good too. Made these in my air fryer. Son and I really enjoyed them. I did the drumettes and flats that I bought already cut apart. This recipe is from the air fryer section. My air fryer is small so it would have taken several rounds to get them all fried, so I opted for the oven version of this recipe. I made the marinade early in the day and left in fridge about around 8 hours. It was a hit with son, daughter, son-in-law and myself. Hubby doesn't eat chicken so I made him something else. These were a huge hit. The coating was crisp and flavourful and the chicken was moist. I followed the oven roasting instructions. The method worked perfectly (I oven-roasted them) resulting in a crisp coating and cauliflower that was tender and held its shape. The flavour was fairly neutral and went well with just lemon juice but I would have liked a bit more oomph. I think it would be delicious with the buffalo chicken nuggets coating. I used the recommended amount (and number of pieces) of cauliflower but needed only 2 eggs. This was a fun and tasty way to enjoy sausages and peppers. The dough was a little finicky and tore in a few places while I was trying to shape the calzones but my patches held and there was minimal leakage. I followed the instructions for oven-baking. Delicious. Had a little problems with the dough but I'm not great at rolling and folding. Some of them didn't look great but didn't deter the taste. Son said best dough and calzones he'd ever had. We used mozzarella, Italian Chicken Sausages and marinara sauce (for dipping) from Aldi's. Made them in the air fryer. Son and I enjoyed this one. The meat was cooked in the air fryer. Salad was good but will be even better with garden tomatoes. I got some Wild Caught frozen salmon recently from Aldi - a 2 pound bag for just over $4. I made one for me in the air fryer as instructed in the book and topped with a half recipe of the salad that goes with this. It was delicious. I only did a fourth recipe of the fish and a half on the dipping sauce. Son doesn't like salmon and hubby's still not eating very good and did feel like fish. Son ate some beer battered fish fillets with some of the dipping sauce. I did the salmon in the air fryer. I wasn't sure about salmon as a fish stick but it was really good. I was out of dill but everything was still good but bet it would have been even better with the addition of dill. Made in my air fryer. Very tasty. We love fish cakes in this house and this recipe did not disappoint. I don't own an air fryer so I followed the alternate instructions for baking them in the oven. The only problem I had (totally my fault) was the cod released a lot of water when I baked the fillets and I did not drain them well enough. So my cakes were very wet and there was no way they were going to hold together for dredging in an egg wash and breadcrumbs. I decided to just sprinkle some breadcrumbs on top of the cakes to get that crunch and skipped flipping them over half way through baking. I also did not have seasoned breadcrumbs in the house so I used whole wheat panko and found a recipe on the Genius Kitchen website for making your own seasoned breadcrumbs. I think this recipe would also be delicious and (very) budget friendly made with canned salmon or frozen pollock fillets. Daughter made this and shared with me. It was delicious and very filling on a cold day. Good but hubby didn't care for it. I enjoyed the addition of cauliflower in this soup. It was great with one of the garlic knots from the Skinnytaste blog. Great flavour and simple to put together especially if you prepared the chicken the night before. These were very tasty, especially with the slaw on the burger. The color of the burgers was certainly unusually pale, but to be expected with chicken and avocado, and didn't really develop grill char marks like the ones in the photo for whatever reason. The patties are quite fragile, but didn't fall apart when flipping as I was very careful and used a thin spatula. Nice when you want a flavorful burger, but also want to keep it light. Picked for Cookbook Club Month 16. If you need help getting dinner on the table, this book is for you. All of the recipes are for dinnertime and they are all made in one pot, skillet, air fryer, sheet pan, etc. It’s a dinner lifesaver! Get a Free 40-Page Bonus Pack including a 4-Week Dinner Plan Plus 3 New Bonus Recipes with Pre-Order. ...is organized by vessels that include everyday cooking equipment such as an Instant Pot®, a sheet pan, a Dutch oven, a skillet, a slow cooker, and an air fryer. For your Instant Pot, electric pressure cooker, slow cooker, multi-cooker, Dutch oven, sheet pan, air fryer, skillet, and more, 140 healthy and delicious recipes that are big on flavor and low on calories and clean-up. The perfect resource for busy home cooks looking for easy, good-for-you dinnertime solutions, #1 New York Times bestselling author Gina Homolka incorporates her healthy, flavor-forward recipes with everyone's favorite way to cook -- in one vessel, whether a sheet pan or multicooker, and everything in between. Whether you'd like to lose weight or just eat a little healthier, Skinnytaste will make your weeknight dinner routine even simpler with satisfying, all-in-one recipes. Cooking in a single vessel means streamlined dinners with minimal fuss, multitasking, and clean-up -- a huge plus after a long day. Skinnytaste One and Done is organized by vessels that include everyday cooking equipment such as an Instant Pot, sheet pan, Dutch oven, skillet, slow cooker, and air fryer. As always, the recipes are big on flavor and light on calories, and now more convenient than ever. 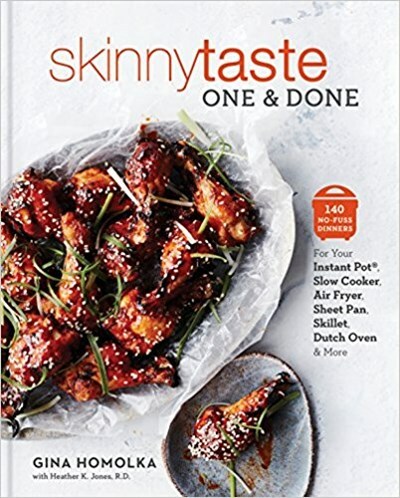 With 140 healthy, family-friendly recipes, 120 full-color photos, nutritional information for every recipe, and Gina's signature cooking tips, Skinnytaste One and Done is a weeknight game changer.